Registration control is more accurate & repeatable. 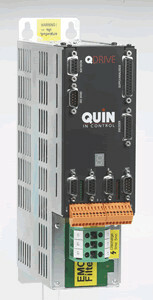 Quin’s Registration Controller maintains the feed of material, or product, to achieve more accurate and repeatable registration than is possible with traditional clutch & brake techniques. The Registration Controller uses a servo motor synchronised to the main drive of the machine to ensure that feed is accurately maintained: regardless of slip, condition, size or length of the material. Product registration marks are detected by a photocell. Adjustment to product length is completely automatic, eliminating complex set-up procedures.